A modern and well presented second floor apartment within this popular riverside development to the west end area of Lincoln. There are views from the balcony along the Fossdyke Navigation. The development is within close walking distance to the Lincoln West Common and the City Centre. The apartment boasts spacious living accommodation briefly comprising of Hallway, Open Plan Living Kitchen Dining Area, Two Bedrooms and Bathroom. Outside there is an allocated parking space. 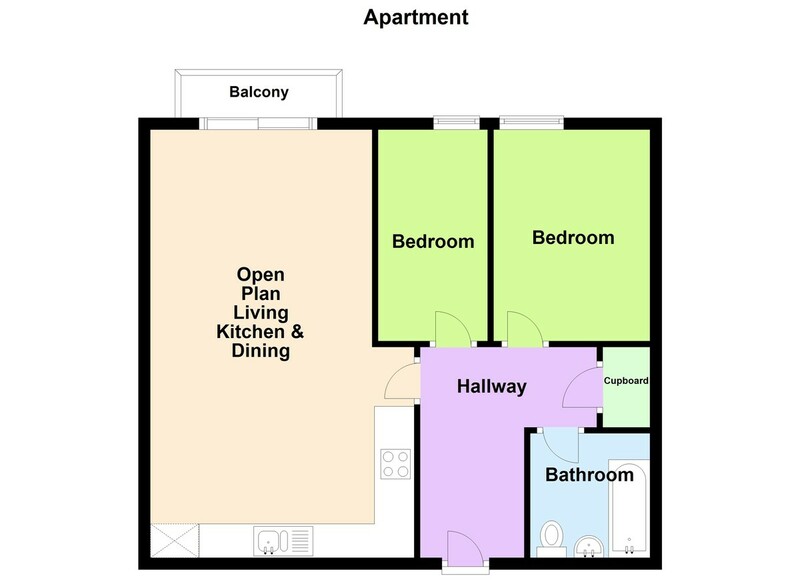 The apartment offers an ideal home or a buy to let opportunity. Currently Let, achieving a rental income of £725 pcm (approx. 5.5% yield). The property is also being sold with the added benefit of No Onward Chain. LOCATION The property is situated within this modern new development located within close proximity to Lincoln City Centre. Walkways along the Fossdyke in either direction are accessible and there is very easy access to all amenities and facilities in Lincoln City Centre, including High Street Shops and Superstores, Supermarkets, Leisure Facilities and all grades of Schooling. The popular West Common is also close-by. Photos were taken prior to start of the tenancy (August 2018). HALLWAY With door to the communal hallway, radiator, intercom, access to the roof void, storage cupboard and doors to open plan living dining kitchen, two bedrooms and bathroom. KITCHEN AREA Fitted with a range of wall, base units and drawers with work surface over, 1 ½ bowl stainless steel sink unit and drainer with mixer tap, integral oven, four ring gas hob with extractor fan over, radiator and wall unit housing the gas fired central heating boiler. LIVING AND DINING AREA With south facing UPVC double glazed sliding doors to the balcony and radiator. BEDROOM 1 11′ 8" x 8′ 8" (3.56m x 2.64m) , with UPVC double glazed window and radiator. BEDROOM 2 12′ 1" x 6′ 5" (3.68m x 1.96m) , with UPVC double glazed window and radiator. BATHROOM 6′ 9" x 6′ 8" (2.06m x 2.03m) , with suite to comprise of low level WC, wash hand basin, tiled splashbacks, bath with tiled surround and mains shower over, radiator and extractor fan.